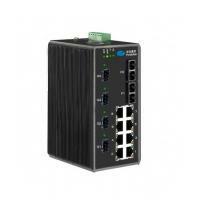 OnAccess740 is a managed Layer 2+ GE industrial Optical Ethernet switch. 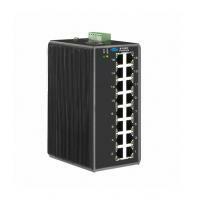 It has four 1000Mbps fiber optic ports with optional SFP module, two 100Mbps fiber optic ports and eight 10/100Mbps electrical ports. OnAccess740 is designed to meet the various industrial application needs and provide industrial Ethernet network communication solution with a high performance-price ratio. OnAccess 740’ s high availability and reliability, as well as the rich security features, makes it ideal for secure data transmission. OnAccess740 also features powerful Web-based ,CLI management capabilities, wide input range dual power supply and its support for DIN rail and panel mounting for installation in the industrial environment. "Fast Ring Protection" (FRP) is a proprietary technology of Shenzhen First Mile Communications Ltd., designed specifically for industrial applications, to provide a fast Ethernet ring protection and recovery within 30ms. From the management console, users can choose any port (normal Ethernet port or trunk port) to form an Ethernet ring for faster recovery and wider bandwidth.